Protect your garden and flowerbeds from weeds by using Preen Organic Vegetable Garden Weed Preventer. It prevents annual weeds from growing in vegetable gardens, flowerbeds, around trees and shrubs. Safe for use around children and pets. Preen Vegetable Garden Weed Preventer has different options and/or variations, please choose below. Preen Vegetable Garden Weed Preventer contains corn gluten meal. It is an organic by-product of the wet-milling process, and is sold as a feed ingredient for cattle, poultry and other species of livestock. It has been used in fish food for commercial fish production. Corn gluten meal is also a primary component in some dog food products. Corn gluten meal is 60% corn protein, and it is this high level of protein that inhibits the growth of seeds. Preen Vegetable Garden Weed Preventer is an organic product that is safe for use around children and pets. As with any product, allergic reactions can occur in some individuals. The product prevents annual weeds from growing in vegetable gardens, flowerbeds, around trees, shrubs, and ground covers for up to 4 to 6 weeks. You can use it around new vegetable plants that are 2-3 inches tall and have true leaves. Do not use on newly seeded areas. Rake the product lightly into the soil. If excessive rain occurs it may be necessary to re-apply. Can be used up to the day of harvest. Covers 5 lbs per 250 sq feet. Available in 5 lbs. or 25 lbs. Safety: Preen Vegetable Garden Weed Preventer is immediately safe; children and pets can play in the area right after use. As with any product, some individuals may have an allergic reaction to inhalation of dust. Preen Vegetable Garden Weed Preventer is an organic product that will biodegrade and add organic nitrogen to the soil. 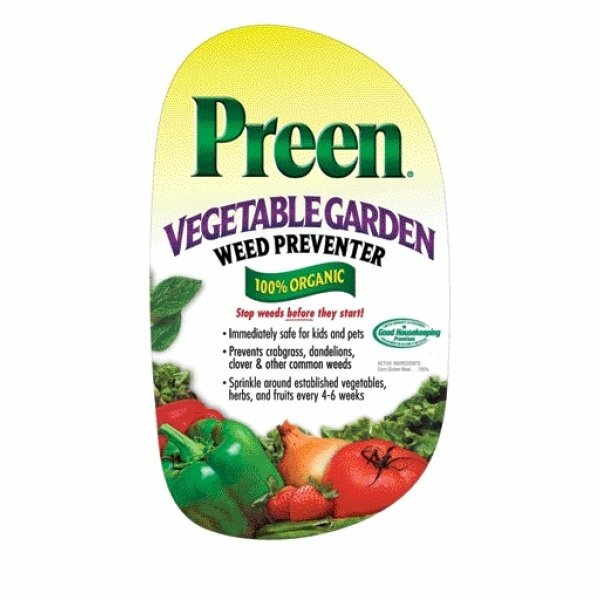 Preen Vegetable Garden Weed Preventer is safe for use around and under bird feeders and bird houses. Simply follow the instructions and water the product into the top 1 to 2 inches of soil so the birds will not use this as a food source. It will not harm them if they do, but it will remove the weed prevention. Preen Vegetable Garden Weed Preventer will not harm earthworms. Made in the usaCorn Gluten. Made in the usa11-23-10 Fertilizer.